You are currently browsing the Body Piercing News weblog archives for June, 2010. When can I change my initial body piercing jewelry? It is normal to want to change out of your initial jewelry as quickly as possible. Initial body jewelry is usually overly large, uncomfortable (especially for tongue piercings), and plain-looking. Although initial jewelry may be irritating in it’s lack of sexiness, these characteristics are necessary to allow for swelling and proper healing. 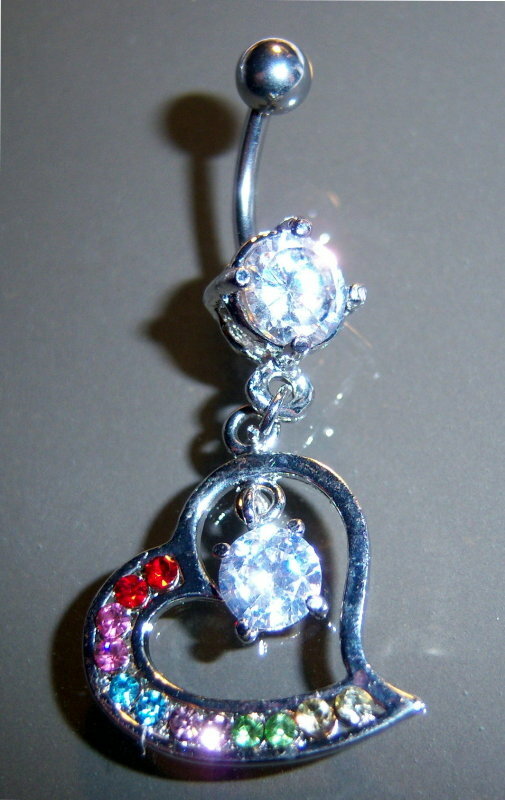 Initial piercing jewelry used by professional piercers should always be sterile and come in a sterile pouch with color-changing indicator, as opposed to fancier body jewelry (shown) that is designed to be worn after you are completely healed. The reason it is a bad idea to rush into something fancier is because the metals found in fancier designs (rhodium, gold, silver, etc.) can cause an allergic reaction if worn before healing is complete, leading to longer healing times or rejection. So how do you know when it’s okay to make the change? As a general rule, when you are able to move the jewelry easily (and there is no longer any noticeable swelling or profound redness to the area) it is safe. However, it is important to continue with any aftercare regimen you were given by your body piercer for the full duration of time indicated. If you have any questions or are unsure if you have healed enough to safely make the change, contact your body-piercer before changing out. Professional body piercers are in high demand and can easily make upwards of over $100.00 per hour. To become a professional body piercer you will need to do two primary things. First, you must fulfill the requirements of the health department overseeing the county you will be piercing in. Then, you will need to familiarize yourself with the tools, jewelry and procedures used in body piercing. A great way to get everything you’ll need for your new career is with a professional starter body piercing kit . These kits have the tools, prep materials, body jewelry and needles necessary for body piercing. Try to find a starter kit that gives you everything you will need to do a good amount of piercings as well as instructional video access and aftercare guidelines. You will also need to fulfill the requirements mandated by the county you live in. Usually these involve registering with your county health department as a piercer, as well as completing an approved bloodborne pathogen training class (usually required yearly). The other thing most health departments require is that you undergo a series of Hepatitis B vaccinations (usually three shots total). Although there are online bloodborne pathogen courses that claim they are approved by health departments, they are not. The easiest way to find an approved course is to contact your health department for their list of approved courses in your area. The last thing you will need to do is practice body piercing under the supervision of a professional body piercer, for anywhere from 3 months to a year. The best way to do this is through an apprenticeship, similar to a tattoo apprenticeship. Not only will you learn proper piercing procedure, but you should learn proper sterilization procedures for tools, shop surfaces and how to use and autoclave. Also pay attention to the business aspects of a shop’s operation; customer service, legal forms, and how to address client questions and concerns. Most shops take on apprentices but do not pay them for the time they are learning. Where is Body Jewelry Manufactured? With some minor exceptions, the vast majority of body jewelry is manufactured in China or South Korea. Although many sellers of body jewelry claim to be ‘manufacturers’, they are actually importers, or wholesalers at best. The line is blurred when it comes to companies that contract foreign factories to produce custom designed pieces. Although these companies are designers (or contractors), they are still not manufacturers since the products are still made in factories outside of the United States. Although the question of who actually produces the body jewelry is not as important as what the piece is made of (quality of steel and construction). The misrepresentation of what a company is should be a major point of contention for customers. 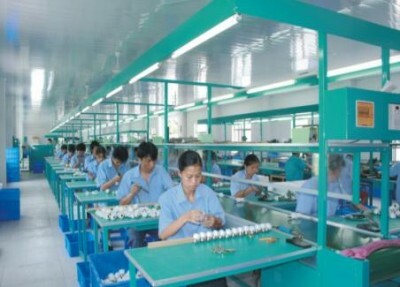 The reason for concern regarding false claims of corporate identity (either being a ‘factory’ or ‘manufacturer’ as opposed to being an importer) is that a seller is making a misrepresentation to the customer, and in if a company is lying about something as important as what they are, it begs the question: what else are they misrepresenting? When it comes to purchasing products that are as personal and delicate as body jewelry, you need to know exactly what you have before you put it against your skin. A tragus piercing is the piercing of the tissue that protrudes in front of the ear canal. This piercing is usually performed with a small gauge hollow piercing needle (16g down to 20g in size) that is either curved or straight. These items can be found in a body piercing kit or bought separately from a trusted supplier. To prevent the needle from damaging the inside of the ear, a small cork is usually placed on the inside of the ear canal to receive the needle. Since there are few nerves in this area, a tragus piercing tends to be less painful than other body piercings. 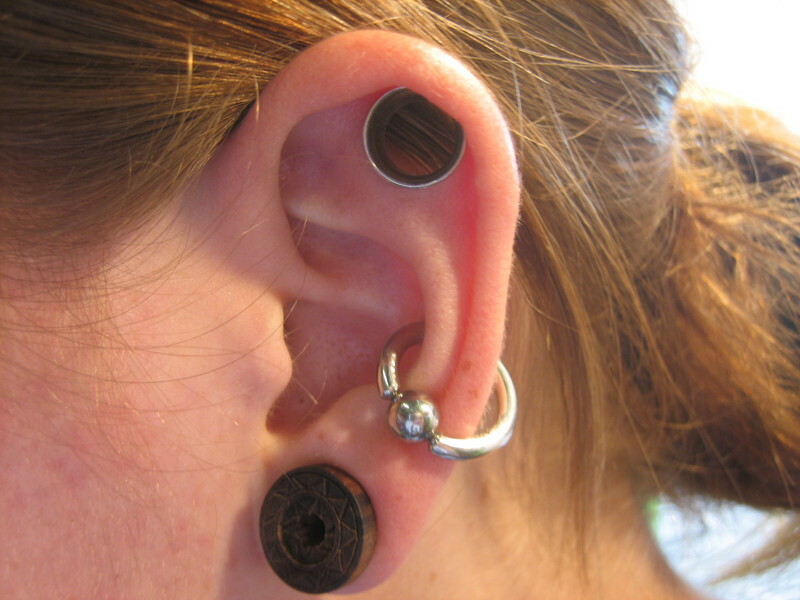 The most common type of jewelry worn in the tragus piercing is a small gauge Captive Bead Ring. 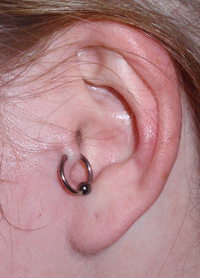 Tragus piercings take approximately 8 weeks to heal. Aftercare requires daily cleaning with a non-iodized sea salt and water solution (1/4 teaspoon per 8 ounces of warm water). As with all body-piercings, it is important to not touch the pierced area with your hands (nor allow anyone else to do so), except while cleaning. Also, change your pillowcase often to lessen bacterial contact during healing. It is also a good idea to wear button-up tops to eliminate chance of snagging the jewelry on clothing. Many women assume that one of the sacrifices they will have to make during pregnancy is losing their belly piercing. Because of the vast changes in skin mass and shape during pregnancy, it becomes virtually impossible to wear standard body jewelry. Adding to this complication, metallic body jewelry will interfere with routine scans and diagnostic procedures. It is easy to see why so many women stop wearing their belly rings completely during pregnancy and resign themselves to painful re-piercing after the baby is born. 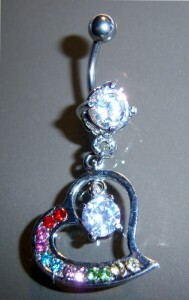 The perfect solution for this dilemma is a pregnancy belly piercing retainer (shown). This custom-made piece of body jewelry is completely non-metallic, made of PTFE (a Teflon-like material) for comfortable wear and ease of use. These retainers come in 1.5 to 2 inch lengths and can be adjusted by cutting them to the length needed and then screwing the self-threading ball ends onto the final piece. The pregnancy retainer can be worn during the full duration of the pregnancy and does not have to be removed during scans and diagnostic procedures. In body piercing, there are four basic types of sterile piercing needles; straight needles, curved needles, I.V. Catheter (also known as Cannula) needles and internally-threaded needles. For many piercings, any of the straight needles will suffice. 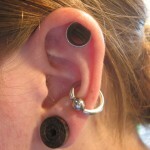 However, some piercings (like the tragus piercing) require curved needles. Cannula needles are very popular in Europe and are becomming more popular in the United States. Internally-threaded needles (shown in photo) feature threads at the rear of the needle that enable the piercing jewelry to attach to the needle itself, creating a smooth, continuous piercing surface. This attachment enables the piercer to both pierce and install the initial jewelry at the same time. Once the needle is through the skin and the jewelry in place, the needle is unfastened from the jewelry, leaving the jewelry in place without further manipulation. Once you’ve decided to get a body piercing, the most important thing becomes finding the right body piercer for you. Try to go to a piercer that is recommended or well known in your area. Good piercers will have a following of regular customers. If you haven’t heard of any piercers in your area, go and check out some shops in person. The first thing to note is the shop’s cleanliness – the piercing area should be clean in all aspects; floors, walls, chair, tools, etc. etc. Feel free to ask to see their business license and any other credentials they have. Also make sure that all body piercing supplies used at the shop are sterile, organized and kept in sterile pouches. You should not see any needles, tools or body jewelry exposed to the air or outside a sterile pouch prior to piercing. If you see anything to be used on you that is not coming out of a sterile pouch, leave immediately! You should also be comfortable in the shop, not only with the overall cleanliness of the shop itself but with the piercer. Feel free to ask questions regarding his/her experience, what type of jewelry they use or what techniques they use for various piercings. If the piercer is legitimate, they will not mind answering your questions. If they do not look clean, or become annoyed with your questioning, it would be a good idea to find another piercer who you are comfortable with. Make sure you are absolutely comfortable with both the shop atmosphere and the piercer, for optimal piercing results you should be completely relaxed and alert. Lastly, it is not a good idea to drink alcohol before getting a piercing. Although alcohol may act to lessen the pain experienced, it is not a good idea because it can cause excessive bleeding. Many types of body jewelry available feature Cubic Zirconia (or CZ) gems in varying sizes and shapes. CZ is a crystallized form of zicronium dioxide (ZrO2), a synthesized material that is optically flawless and very hard. CZ approximates the qualities and appearance of a diamond so closely that it is used as a substitute for diamonds in jewelry of all kinds. Since 1976, CZ has become the biggest competitor to diamonds in the jewelry business, and has become the primary choice for body jewelry due to it’s beauty and economical price. What makes ear jewelry smell? Whether you used a self piercing kit or went to a body piercer to get started stretching your ears, you may notice the jewelry begins to smell bad after a couple weeks. This is a common problem due to the type of oils produced by the skin of the ears. One of the things that will reduce this type of odor is to thoroughly wash your ear lobes and body jewelry each day. A good time to do this is while bathing. The other factor involved has to do with the porousness of the material the jewelry is made of. Highly porous materials such as wood, stone and bone will tend to smell more often than less-porous materials such as steel or titanium. Regular rotation (not wearing any single pair more than a couple days) combined with daily cleaning should greatly reduce or eliminate the odor entirely. An autoclave is a specialized type of instrument used to sterilize objects. Some autoclaves use steam that heat water up to 134 degrees C (273 degrees F). Once heated to this level, the temperature must be held constant for at least 15 to 30 minutes (depending upon the unit). The two types of autoclaves in widest use are steam (which incorporate pressurized water vapor) and dry-heat (which achieve sterilization through high temperatures). To assure an autoclave is operating properly, spore tests are regularly conducted. A spore test strip is placed inside the autoclave and cycled through a batch. Once finished, the test strip is sent off to an independent lab for testing. The lab will check for the presence of spores (or absence of) and determine if the autoclave has ‘passed’ or ‘failed’. Spore testing is required by law for all tattoo parlors and body piercers that re-use their tools and own autoclaves. Spore testing and autoclaves are not required for body piercers and tattoo artists if pre-sterilized body jewelry and disposable tools are used.